The measure & system control dialog box can be activated by clicking on the Measure & System Control icon. This is only effective if the score formatting is static. This can be changed in options. Controls the number of measures and systems on your score. Only effective if Score Formatting is Static. You can update the number of measures per system. If This Page is selected, your selection will only be executed for the current page you are on. 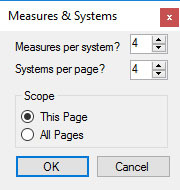 If All Pages is selected, your selection will be executed for your entire score.